1. Heat the oil in a non-stick frying pan over medium heat. Cook the garlic for 2-3 minutes or until light-golden and crisp. Remove the garlic from the pan, then drain on paper towel. Pour the oil into a small bowl, leaving a little in the pan, then set aside. 2. Grill the bread on a chargrill pan or barbecue grill-plate over high heat and keep warm. 3. Bring a saucepan of water to the boil over high heat, then add a pinch of salt and the vinegar. Make sure that the water is gently turning over (boiling) at a simmer. Working quickly, crack one egg at a time into the simmering water, leaving a little space between each egg. Poach the eggs for 3-4 minutes. Gently lift the eggs from the water with a slotted spoon, then drain on paper towel and season with a pinch of salt and pepper. 4. Meanwhile, heat the non-stick frying pan over high heat. Add the mushrooms and fry for 4 minutes or until golden, then add the butter and cook for another 1 minute. Add the parsley and remove from the heat. 5. 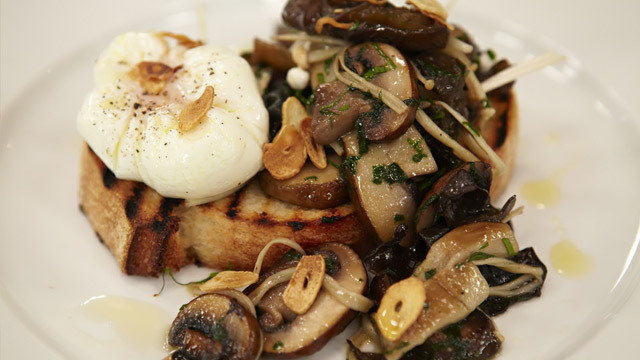 Divide the mushrooms and eggs between the warm toast, sprinkle with the crisp garlic, then drizzle with a little of the reserved garlic-infused oil and serve. This entry was posted on August 9, 2010 at 7:11 am and is filed under Cooking, Family, Friends, People, Random, Recipe. You can follow any responses to this entry through the RSS 2.0 feed. You can leave a response, or trackback from your own site. I am a breakfast person and this is fabulous! I also love mushrooms. I poached an egg this way one time in the past. The irregular shape makes it perfect for this recipe. Easy, nutritious, delicious! Thank you for sharing. A perfect Italian dish to serve the relatives…with a smile. 🙂 Thanks.